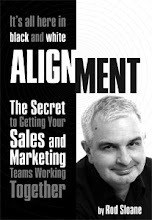 Sales and Marketing Alignment Blog from Rod Sloane: Why most blogs are deadly boring and dull to read. Why most blogs are deadly boring and dull to read. And you don't care about me. When was the last time you picked up the phone to me? You see you don't care, do you! Stop pretending you do, and stop listening to all those new age hippies who talk about this crap. So stop talking about yourself and start talking about me and my interests. And no, I don't care where you are going on holiday. Have you been to Blackpool? See!